The front page of last Friday’s Washington Post reports on the Vietnam Veterans Memorial Visitor Center approved by the National Capital Planning Commission (NCPC) at their meeting on August 3rd, the latest assault on the National Mall’s integrity. 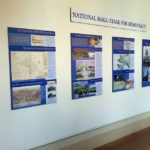 The story quotes the National Trust for Historic Preservation and the Coalition, as well as Ray Saikus, a Vietnam veteran who spoke eloquently and passionately against the site and Congress interference in the public review process by mandating the site. See also the article in The Examiner, copied below. The federal commission with final say over monuments and memorials in the nation’s capital gave the green light yesterday for the newest addition to America’s front yard: a sprawling underground Vietnam Veterans Memorial visitor center that will be constructed between the Lincoln Memorial and the Vietnam Veterans Memorial wall. The center will be the first new memorial project on the coveted Mall since the National World War II Memorial was built. Preservationists, who have wanted to conserve the Lincoln Memorial’s grounds, fought the center. But the project was championed by some veterans groups that have long been troubled by the understated nature of the Vietnam Veterans Memorial wall and want to provide more history and context for its list of more than 58,000 Americans killed or missing in the war. With memorial space at a premium in Washington — where some groups have quietly fought for years to get patches of land inside traffic circles for memorial statues or slivers of pocket parks for monuments — the Vietnam veterans won one of the biggest prizes of all yesterday. “It’s a good day. This was a long time in coming,” Jan C. Scruggs, president and founder of the Vietnam Veterans Memorial Fund, said after the National Capital Planning Commission approved the project yesterday. 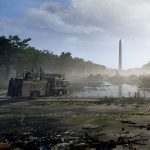 The project has drawn criticism because of its potential to convey conclusions about a conflict that tore the country apart. But Scruggs said the 25,000-square-foot center will be a neutral, fact-based presentation that will pay tribute to U.S. soldiers. It may include a movie theater, a three-dimensional battle scene, mementos left at the memorial, and a wall where pictures of slain soldiers will be projected on their birthdays, creating a dynamic tribute that changes daily. Because it will be the only sizable visitor center dedicated to a single conflict’s veterans, some planners worry that it will create an opening for others to lobby for similar additions to memorial rotundas, fountains or statues in Washington. “Each memorial will ask for their own visitor center,” warned Elizabeth Merritt, deputy general counsel for the National Trust for Historic Preservation, who testified against the project at the commission meeting yesterday. Not all veterans like the project. Vietnam War veteran Ray Saikus flew in from Cleveland yesterday to tell the planning commission that an underground “bunker or tunnel” is insensitive to veterans who fought enemies underground. “It will be more a tribute to the Viet Cong,” Saikus said. Planners do want it out of sight — but for aesthetic reasons. 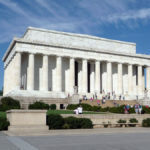 According to 14 design guidelines established by the planning commission yesterday and the U.S. Commission of Fine Arts last week that must be followed as a condition of approval, no portion of the center can be visible from the steps of the Lincoln Memorial, Constitution Avenue or surrounding streets. The center must be built below the existing grade on the land surrounding the Lincoln Memorial. Any skylights, monitors, light wells or sunken areas cannot be seen from surrounding sidewalks, according to the commissions’ guidelines. Among the other requirements: The center must have a single entrance for both visitors and service personnel, and the lighting must be subtle. The footprint of the center must be within the root areas of the existing elms, and no new parking can be constructed to accommodate the visitors. The center will cost $100 million, of which the Vietnam Veterans Memorial Fund has raised $25 million. The sponsors expect to have a design selected by the end of this year and plan to get final approval for construction early next year. Some preservationists worried that the requirements will be circumvented because of political pressure. The campaign for the visitor center was fueled by the same kind of passion that Scruggs brought to win creation of the Vietnam Veterans Memorial, a subtle tribute dedicated in 1982 that consists of simple granite panels containing the names of the dead and missing. Some Americans had trouble conceptualizing a nontraditional memorial without trappings such as statues and fountains. But it is now the most popular site on the Mall, with 3.8 million visitors last year. This time, Scruggs had congressional help. Legislation was passed in 2003 that made the center an exception to the 2001 creation of the Mall’s “reserve” area, where new construction is banned. The legislation did not specify a site, however, and Scruggs knew he wanted it front and center. The rigorous site selection process that sent him to several federal agencies dictated that his group study other sites on less prominent pieces of land. When that wasn’t enough to eliminate the other study sites, he took his case to Congress. A representative introduced a bill to the House in March that pinpointed the site he wanted. It passed by a vote of 404 to 4 and is lingering before the Senate. Senate approval would mean little, now that the planning commission has approved the site. As part of its review, the commission examined an environmental assessment report that determined that the center would have a minimal impact on the area. WASHINGTON – The Vietnam Veterans Memorial Center, a proposed $80 million educational facility to be built under the National Mall, can finally move forward after a regional planning agency approved a site steps from two national icons Thursday. The selection of a 5.2-acre parcel bounded by Henry Bacon Drive, 23rd Street, Constitution Avenue and the Lincoln Memorial ends a heated 16-month debate between veterans, conservationists and Congress, and should make moot legislation currently circulating through Congress to force the issue. “It has been a long process, but our success today makes it all worthwhile,” said Jan Scruggs, founder of the Vietnam Veterans Memorial Fund. However, critics remained skeptical, fearing the impacts of another memorial built into a more crowded National Mall. “When the National Mall and politics collide, too often the Mall loses,” said Judy Scott Feldman, chair of the National Coalition to Save Our Mall. In its unanimous approval, the National Capital Planning Commission stipulated design guidelines it hopes will safeguard the character of the Mall and views from the Lincoln and Vietnam memorials. A number of commissioners were wary of the proposal, fearing adverse effects from lights, traffic and one National Park Service plan to elevate the ground up to 10 feet. But the group was pressured to act by Congress. The House had already passed a bill mandating the chosen location, with proponents claiming the commission was studying the issue to death. The revised design guidelines would mitigate the center’s impacts, commission staff said. Among them: No portion of the building, or the light emanating from it, should be visible from the Lincoln Memorial; the ground should remain at its current grade; the center should not intrude into the landscape with such items as skylights; and there should be no new vehicle parking areas. Donald Murphy, representing the Department of the Interior on the commission, said the Park Service “morally believes these guidelines are binding,” and pledged to follow them. The 25,000-square-foot center will force the removal of existing softball fields. The next step is design, which should take three to four months. The National Capital Planning Commission will review the design three times before final approval.